The complexities, heterogenous contexts and causes of Europe’s current migrant crisis can’t be defined by a series of questions, but they serve to offer a framework in which to consider how action is, and should be, taken on-going. The participants of this crisis are not solely the migrants themselves, but also the governments and political personnel involved in the protection of their state, the citizens that accommodate asylum seekers, and the stories they tell for those left behind. Migrants predominantly come from areas of economic or political disturbance and conflict. As images in the press have indicated, migrants canvas all the life ages, from children (such as the now ubiquitous snapshot of the Aylan Kurdi, the Syrian boy washed up on a Turkish beach) to adults, able-bodied to disabled, solo and collective. However, the United Nations High Commissioner for Refugees reported on 1 September that 72% making the crossing are adult men, representing a self-consciously able workforce. Their common denominator is their desire for a life worth living. Definable as any person who changes his or her usual country of residence as asylum seekers or economic movers, ‘migrants’ as a term is often misguidedly used interchangeably with ‘refugee’. Refugees are guaranteed some form of protection under international law, whereas migrants are not necessarily secure. Refugees are identifiable as being obliged to leave their home due to persecution for reasons of race, religion, or identification with certain social and political orientations. Asylum nations cannot return these persons to their countries of origin if it would put their lives at risk. According to the UN Refugee Agency (UNHCR) over 380,000 migrants have arrived on the shores of Southern Europe in 2015. The term ‘European migrant crisis’ was coined and put into use in April 2015, when five boats, carrying over 2,000 people to Europe sank in the Mediterranean Sea, with at least 60% of those passengers dying. While Antonio Guterres, UN High Commissioner for Refugees alarmingly said that ‘there is no humanitarian solution for this tragic humanitarian crisis’, many migrants feel differently. Among those arriving this week in Germany, there was a resurrection of a motto that circulated during the Arab Spring: ‘the power of the people is greater than the people in power’. Both must work together to see what solutions can be arrived at, even if they do not offer a universal answer. 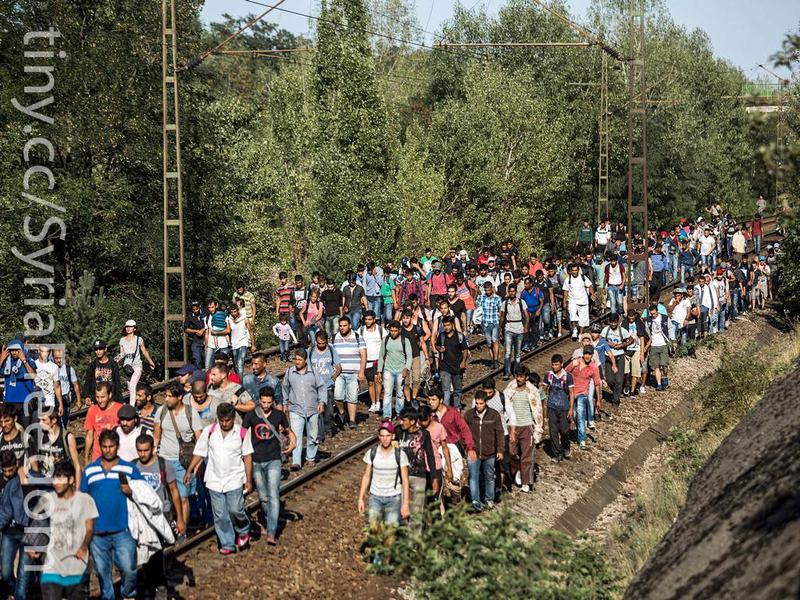 Political unrest in Africa, the Middle East and South Asia is reconfiguring migration trends in Europe. The most commons migrant origins include the Middle East (Iraq, Syria,Yemen), Africa (Eritrea, Gambia, Nigeria, Somalia, Sudan), the Western Balkans (Albania, Bosnia and Herzegovina, Kosovo, Macedonia, Serbia) and South Asia (Afghanistan, Bangladesh, Pakistan). To reflect the use of technology to map and find solutions to this crisis, Doctors of the World have created a fascinating real-time map with digital agency Impero which monitors positive Tweets (#RefugeesWelcome) along the routes taken by migrants. In 2011, thousands of Tunisians arriving at the Italian island of Lampedusa marked a watershed moment in the number of illegal border-crossing detections in the EU following the start of the Arab Spring. Shortly after, Sub-Saharan Africans who had previously fled to Libya from upheaval in the post-Gaddafi era followed suit to Lampedusa. More recently, the world’s media and global health leaders have attended to the spectacle of asylum seekers arriving at the Greek island of Lesbos, near the Turkish mainland, which has fast grown into a key migrant gateway. The migrant crisis situates itself within the topical wider concerns and allegiances of immigration. The International Organisation for Migration has collaborated with the World Bank to create a data visualisation of the figures and populaces that comprise each nation and is available here. 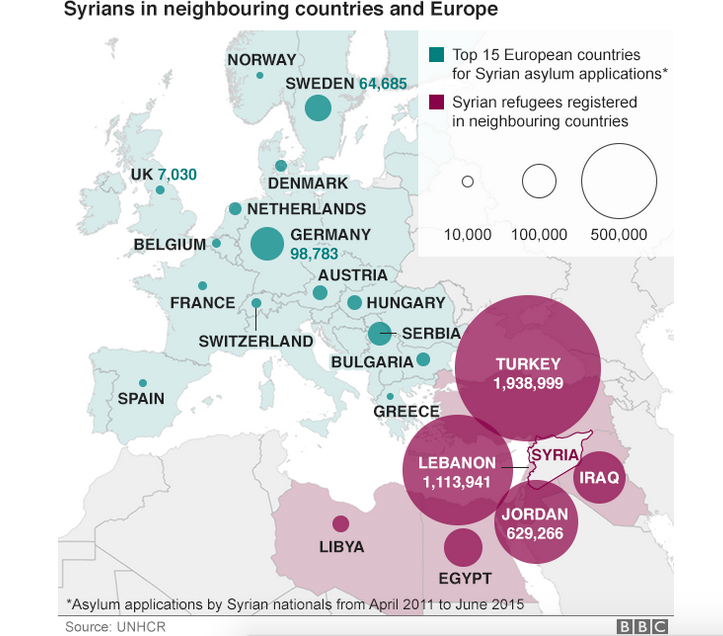 It is a helpful overview, outlining the migrant movements in and out of countries. Individuals seeking asylum are fleeing from conflicts, persecution and poverty that rage beyond their continent’s borders, arriving in the EU to seek safety. Migrants, like refugees, want a better and more secure life. Europe and the global media are only recently registering this influx as a crisis, because it is only now that the tipping point has been reached by the developing countries Lebanon, Jordan and Turkey who had, and continue to, shelter some 3.6 million Syrian refugees. Since the start of Syria’s Civil War in 2011, these countries have absorbed migrants and refugees, but can no longer support a basic standard of care, with international funding inadequate and resulting in overcrowded, impoverished refugee camps. It is unsurprising that from the masses, many such inhabitants looked further afield, not least to the lifeline thrown Chancellor Angela Merkel which ensures that asylum seekers that reach Germany can overturn EU law that demands migrants seek documentation and protection in the first country at which they arrive. They come by sea. They come on foot. They come desperate. Paolo Pellegrin’s captivating photos depict the so-called ‘human flood’ that continues to hit the Greek island of Lesbos and surrounding coastlines. MSF Sea is a newly formed, coordinated programme that carries out relief and rescue missions in the Mediterranean Sea via their boats Argos and DignityI. The tide of peoples crossing the Mediterranean experience life-threatening dangers due to the unpredictable nature of their vessels, navigation and tides. 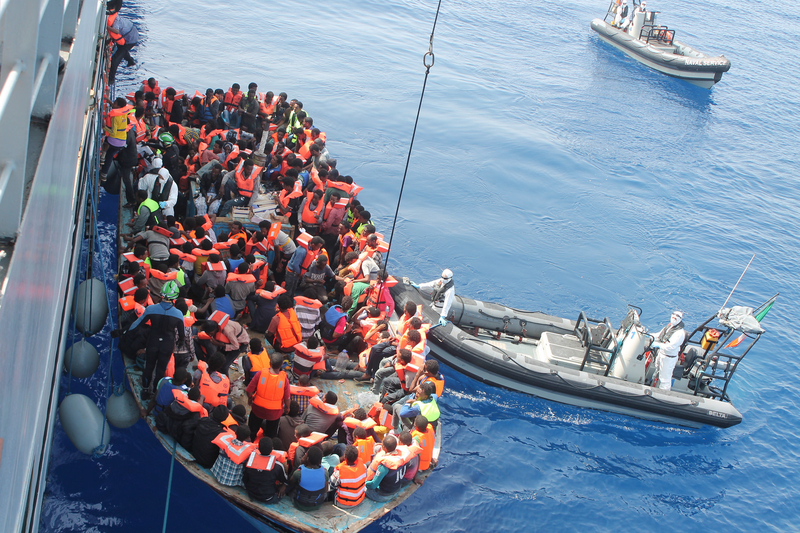 This year alone, 2,850 EU-bound migrants are reported to have died in transit. It is unlikely that this influx will abate until mid-October, when only the most-foolhardy will risk the sea struggle. This apparent alleviation will only be short-lived, with yet more migrants expected to make the crossing to Northern and Central Europe in 2016. European countries are reacting to, and dealing with, the migrant crisis in various ways. Some nations have adopted more liberal asylum policies (including France and Germany), others have offered financial support to enable mobilisation of humanitarian support and practical care, while still others have built fences topped with Dannert wire (as is the case in Bulgaria and Hungary). On Wednesday 9 September, the President of the European Commission Jean-Claude Juncker, called for root-and-branch reform of disparate immigration policies in the EU. In this speech, he also called for European states to accept binding quotas to resettle 160,000 refugees, with the possibility of work for asylum-seekers. It is apparent that questions keep needing to be posed, but while answers can shed some light on the situation, it is practical solutions that must be prioritised.